What a wonderful few days at the end of last week, looking back and forward at the ZigZag story with some very special people - and something mind blowing in-between. The looking back comes from my son, Tom, coming to visit. 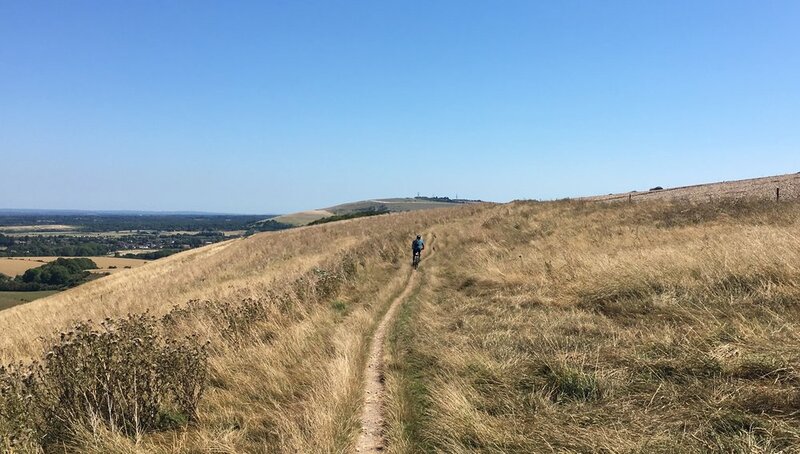 The two of us enjoyed a wonderful mountain bike ride together on the Downs as a late birthday adventure full of memories. It was seven years ago that the first ZigZag incarnation came about: ZigZag Cycling Ltd, set up with friend Nick Finch - more below. Tom joined us as a qualified instructor. Looking back I think this is also where my interest in confidence took root as it was so key to making an enjoyable experience for new riders. I'd previously done academic research into motivation - but this was confidence at its most full on and vital, overcoming uncertain wobbliness and more. I remember thinking at the time that we were doing something right - but if only we could bottle it! Tom and I cycled past what was our Learners' Route, with a little natural bowl where we'd get riders mastering descending. Then on to the beautiful Cissbury and Chanctonbury Rings (a few photos below). Meanwhile Nick is truly out there on his bike. He's now over half way into the 4,000km Transcontinental Race between Belgium and Greece and daily posting up extraordinary pictures of beautiful countryside (and a few cakes). Its an unsupported ride with mountain top check points in Slovenia, Austria, Poland and Bosnia - making for a truly ZigZag route. You can follow Nick's progress by clicking on the map and looking up number 174 - and give him an extra boost by donating here to the charity he's riding for: the iKhethelo Children's Village for orphaned and vulnerable children in his homeland South Africa. Back to the less heroic story and despite our combined passions for helping others escape to the hills, sadly ZigZag Cycling never broke through as a big time business - but it gave the start to what then became the private triathlon coaching business ZigZag Alive. This continues to grow and is so rewarding in terms of helping people (as the strap line says) make new starts, reach new heights and feel alive and well. Alongside growing ZigZag Alive I've also been quietly researching, developing the ideas and practice for Confidence Centred Coaching - a resource of great coaching practice, focused on that all important confidence factor. Maybe not quite selling it in bottles but showing amazing results. I've had so much help and encouragement on the way. The most recent, also last week, was from communications expert Rowena Price. Rowena is helping me refine further what's on offer and how its best communicated to the different sports coaches I hope to reach. Watch out for some pilot workshops directed at different kinds of coaches, such as: those who are relatively new to coaching and would value the support of Confidence Centred Coaching; the more experienced club coaches who want to stay fresh and open to new ideas; and those who are working with individual sports people and are keen to strengthen their practice and deepen their ways of working with clients. If, like me, you feel excited about this aspect of coaching - whether in terms of your own confidence as a coach, building relations of trust with those you coach or looking to support them face their big challenges - please get in touch, sign up, leave a comment below. I know this is going to be another zigzagging path but it'll be great to ride it together. Meantime - way to go Nick!